Lyrical content aside, a rapper’s success is largely based on the quality of the artist’s diction. This is one explanation (again- lyrical content aside) as to how Eminem became so immensely popular in record time. His delivery was crisp and efficient, treating every word as a birth. It may be hard to imagine some bizarro alternate universe where Marshall Mathers is a public orator/motivational speaker, but the natural gift is undoubtedly there. Also possessing of this gift is Elemental Zazen. And while the ambition on Nothing To Lose But Change remains slightly beyond his grasp, his presence is notable. As a hip-hop album, Change is consistent in its inconsistency. 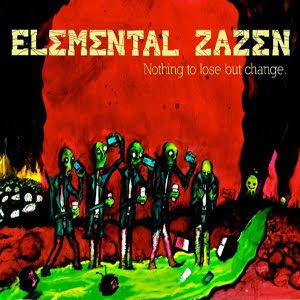 Backed by a strong lineup of guest stars (including Canibus, Fashawn, Gnotes, Jean Grae, and Touissant), Zazen alternates between electrifying and preachy. Album opener “Bricks and Mortality” circles the listener without ever really breaking free. But things kick into high gear with “Kill Em With the Beat”, an Outkast-esque earworm featuring elaborate beats and an ambient synth that is equal parts danceable and jarringly intense. “Lockjaw” follows with a more relaxed delivery akin to the latter day-neutered version of Eminem himself. It works well opposite “Beat”- these two tracks are the record’s highpoint. From “Lockjaw” forward, Change is a series of peaks and valleys. Tunes like “Hello Goodbye Never” and its sample of violins are interesting but feel misplaced- while “Greed” is too brief to be effective. The LP rebounds with “Barbie Doll” and “Blood on the Tracks”, two songs that rekindle the album’s earnest intensity. Zazen addresses many ideas here on Change and this is obviously a very personal work. While almost all of his lyrics are socio-political in nature though, his sharp vernacular is worthy of a better forum. The album sometimes feels too small for his tirades-as if there is not enough room for the accompanying soapbox. Not to say that Nothing To Lose But Change is a subpar effort, it is undoubtedly a commendable rap album from a rising talent. But for an artist who possesses the gift of diction, commendable should only be the tip of the iceberg.